Multiple system atrophy - cerebellar subtype (MSA-C) is a rare disease that causes areas deep in the brain, just above the spinal cord, to shrink (atrophy). MSA-C used to be known as olivopontocerebellar atrophy (OPCA). MSA-C can be passed down through families (inherited form). It can also affect people without a known family history (sporadic form). Researchers have identified certain genes that are involved in the inherited form of this condition. The cause of MSA-C in people with the sporadic form is not known. The disease slowly gets worse (is progressive). MSA-C is slightly more common in men than in women. The average age of onset is 54 years old. Symptoms of MSA-C tend to start at a younger age in people with the inherited form. The main symptom is clumsiness (ataxia) that slowly gets worse. There may also be problems with balance, slurring of speech, and difficulty walking. Spasmodic dysphonia is difficulty speaking due to spasms (dystonia) of the muscles that control the vocal cords. A thorough medical and nervous system examination, as well as a symptom and family history are needed to make the diagnosis. There are genetic tests to look for the causes of some forms of the disorder. But, no specific test is available in many cases. An MRI of the brain may show changes in the size of affected brain structures, especially as the disease gets worse. But it is possible to have the disorder and have a normal MRI. Other tests such as positron emission tomography (PET) may be done to rule out other conditions. These may include swallowing studies to see if a person can safely swallow food and liquid. MSA-C slowly gets worse, and there is no cure. The outlook is generally poor. But, it may be years before someone is very disabled. Call your health care provider if you have any symptoms of MSA-C. You will need to be seen by a neurologist. 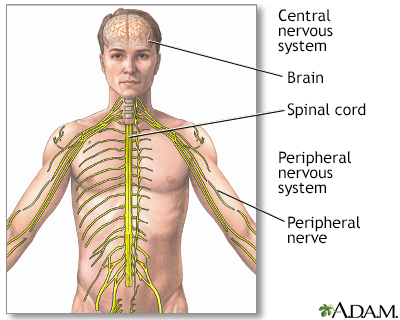 This is a doctor who treats nervous system problems. Ciolli L, Krismer F, Nicoletti F, Wenning GK. An update on the cerebellar subtype of multiple system atrophy. Cerebellum Ataxias. 2014;1-14. PMID: 26331038 www.ncbi.nlm.nih.gov/pubmed/26331038. Jancovic J. Parkinson disease and other movement disorders. In: Daroff RB, Jankovic J, Mazziotta JC, Pomeroy SL, eds. Bradley's Neurology in Clinical Practice. 7th ed. Philadelphia, PA: Elsevier; 2016:chap 96. Ma MJ. Biopsy pathology of neurodegenerative disorders in adults. In: Perry A, Brat DJ, eds. Practical Surgical Neuropathology: A Diagnostic Approach. 2nd ed. Philadelphia, PA: Elsevier, 2018:chap 27.